All teams are kindly asked to note the following events that are taking place at various shows and public events around the country during 2019. These events are great opportunities to showcase our sport to a large audience and all teams are encouraged to support these events as much as possible. Please note that all of the show events require teams to confirm attendance with the organisers and ensure that entry tickets are be obtained in advance. In most cases are free of charge for competitors or subject to a discount. All teams are asked to note the events below and ensure that entry tickets are requested by the dates provided. Please note that no event organiser will pay refunds for anyone who pays to get into the relevant show if they did not get an entry pass. Mon 6th May - North Somerset Show, North Somerset Showground, Bathing Pond Farm, Wraxall, Nr Bristol, BS48 1NE - Weigh In - 10am - First Pull - 11.00 - Weights - Men - 600, 640, 680 - Contact Pete Dyer for further details on 01934 823462. Free entry tickets to the show must be obtained from Pete Dyer at least 2 weeks prior to the date of the show (by 22 April). Sat 18th May – Otley Show – Otley Showground, Bridge End, Otley, West Yorkshire, LS21 2AA – Weigh In 11am – First Pull – 12.00 – Weights - Men - 600, 640, and Catchweight, Mixed - 600kg 4+4 - Ladies and Youth - 520 and 560kg – Contact Dave Hamer for further details on 01422 823397. Contact Mr Dave Scruton for entry tickets on 07713 689388 by 10th May. Sat 18th May - Devon County Show, West Point Exeter - Register from 12.00 - First Pull 13.00 - Weights - men - catchweight - ladies - catchweight - Contact Nick Major for further details on 01364 652984 or 07931 756321. Contact Nick Major for free entry tickets to the show by 30th April. Mon 27th May - North of England Open - Northumberland County Show, Bywell Hall, Near Stocksfield, NE43 7AB - Weigh In - 10am - First Pull - 11am - Weights - 600, 640, 680, Ladies and Youth 500kg, 540kg and 580kg - Contact Joe Birch for further details on 01228 658595. To apply for tickets please send confirmation to joebirch@icloud.com. Advance entry tickets are £10 per adult £3 per child if booked by Friday 17th May. From 18th May, adult prices will be £14 per adult if booked in advance. The organisers can email the tickets to people as well once payment is received and they can just be printed out. Whilst competitors are expected to pay the entry fee into the show, no weight entry fees will be charged. 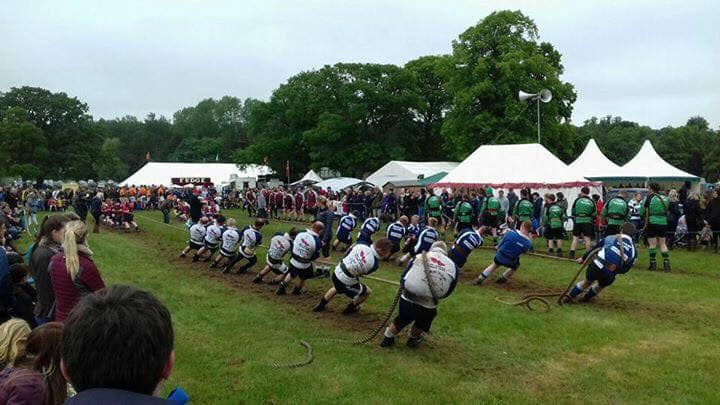 Saturday 15 June - National Championships - Cumberland Show - Please see http://www.tugofwar.co.uk/national-championships-2019 for further details - registered pullers, coaches, organising committee volunteers and officials will be eligible for free entry passes, however spectators will have to pay for tickets, which can be purchased at a discount in advance. Pullers and coaches need to be registered with the TOWA by Wednesday 15 May.